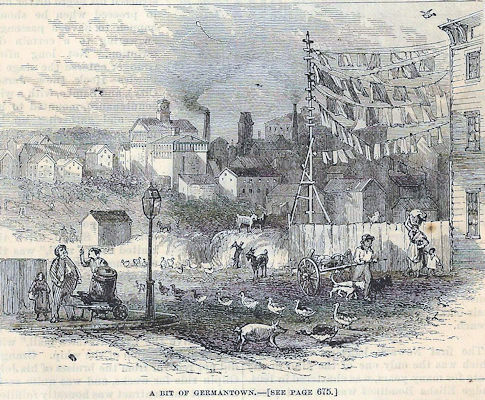 A wondrous tide of Germans has flooded Newark, dropping into all the vacant lots about the factories, and spreading itself over the flats to the east and the hills to the southwest, until it numbers about one third of the voting population. Between the years 1850 and 1860 the increase was 90%. The German quarter on the hills is one of the interesting features of the city. A section of nearly two miles square is a snug, compact, well paved city within a city, giving evidence of neither poverty nor riches. The Germans who dwell here are chiefly employed in the factories and nearly all own their houses. They built to suit their convenience, at odd dates and with varied means, hence there is very little uniformity in the blocks. They live economically, and save money. German habits and German customs appear on every side. The women carry heavy bundles, great baskets and sometimes barrels, upon their heads. At noon you will see women and children running across the streets and up and down with pitchers in their hands. They are going for lager beer to drink with their dinners, which is as indispensable as the dinner itself. And none of them need to go far. There are eight or ten immense breweries within the district. One, no larger, perhaps, than the others, has a sub cellar, arched after the manner of the Cincinnati wine cellars, and extending to a great distance under the buildings and sidewalks, capable of containing fifteen thousand hogs heads of the foaming beverage. The preparation of this article for the market requires incessant and skilled labor. You have but to see the kettle boil, containing one hundred and fifty barrels, and observe the nicety with which every detail of the work is conducted, to convince you that art, if not poetry, may flourish among hops. German Immigrants started to arrived in the late 1840's and 1850's as refugees from the unsuccessful revolutions of 1848. The leaders of the revolution who fled, were men of culture and distinction who became the leaders of Newark's German population. Three of these men were Dr. Louis Greiner, a Munich lawyer who broke out of prison to emigrate, Rev. Frederick August Lehlbach, who fled a fifteen year prison sentence and Dr. Fridolin Ill, who lost his medical practice because of the side he supported, fled the county and resumed his practice in Newark. The bulk of the German immigrants became factory owners and workers, jewelry makers, and brewery owners and workers. They mainly settled in the HILL section, which at that time was the wooded region lying to the west and northwest of downtown Newark, the Sixth Ward. Today the approximate borders of this land are High Street, Clinton Ave, Irvine Turner Ave., and Springfield Ave. This area was recreated as a German Village, including beer gardens, singing societies and turnvereins (Athletic Clubs). By 1865, one third of Newark's population was either German or of German heritage. The custom of visiting beer gardens and singing on Sundays, along with their belief in public aid to parochial schools drew the ire of the Anglo-Saxon townspeople. The German immigrants worked hard all week with Sunday afternoon being their only time for relaxation and enjoyment. The names of the famous German Brewers of Newark were Hensler, Krueger, Feigenspan, Schalk, Trefz, and Laible. Some less famous ones were Frielinghaus (my great-great-grandfather), Traudt and Rumpf. The largest brewer in Newark was a Scotsman, Peter Ballantine, but he concentrated on making the light lager beer enjoyed by the Germans instead of the heavy English ale of his ancestors.